As days are passing by, it is getting colder here. The most comforting thing you can have in such weather is a hot bowl of soup. This soup is by far my favourite soup and gets a place in my menu very often. Here is how I make it. 1. Chop the tomatoes in large chunks. Peel the carrot and chop it in chunks. Slice the onions and mince the garlic. Add all these in a pressure cooker and add about 200 ml of water and cook it till 1 whistle on medium high. 2. While it is cooking mix butter, grated garlic and mixed herbs/basil and prepare a flavored butter. 3. Remove all the edges from the bread and cut into small equal pieces. Toss them with olive oil and mix herbs and spread them on a lined bling tray. Put them in a a oven preheated at 180 C and bake for 3-4 minutes. Toss them again and bake for another 3-4 minutes. Keep an eye, as they get burnt very easily. When baked, they will be crisp and light golden in color. 4. One the ingredients in the cooker are cooked. Cool them a bit and then churn into a fine purée. 5. Sieve the purée to make it smooth. Heat a pan and add the liquid mixture into it. Add salt, sugar and pepper to taste. If you want the soup to be thinner, add water accordingly. 6. Serve it hot topped with a little flavored butter and herbed croutons. 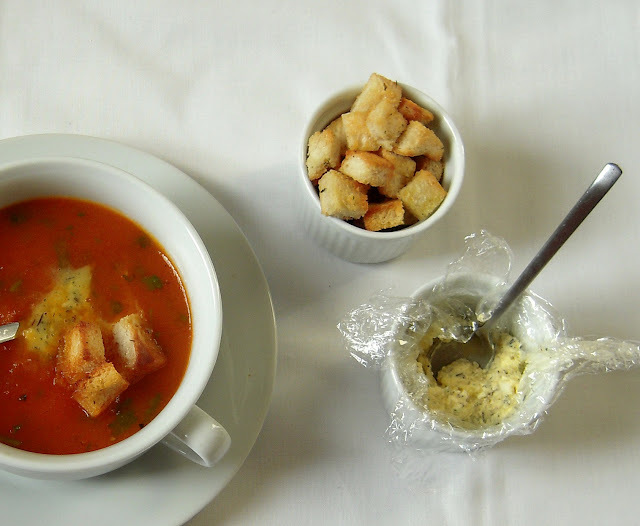 Tip: If your soup gets thinner than you like then it can be rectified in the following way. Mix about 1/2 tsp of corn flour( or more to make it more thick) in 3-4 tbsp of water to make a smooth paste. Add it to the boiling soup. Keep stirring and the soup will get thick. 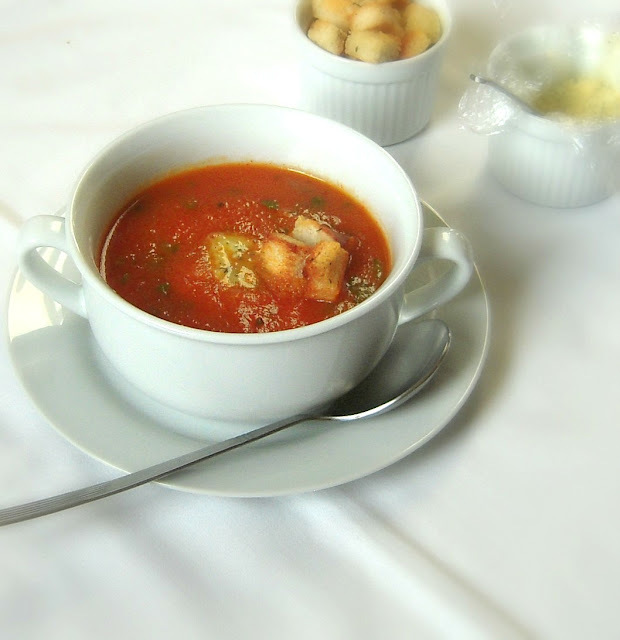 Enjoy this soup on a cold evening! 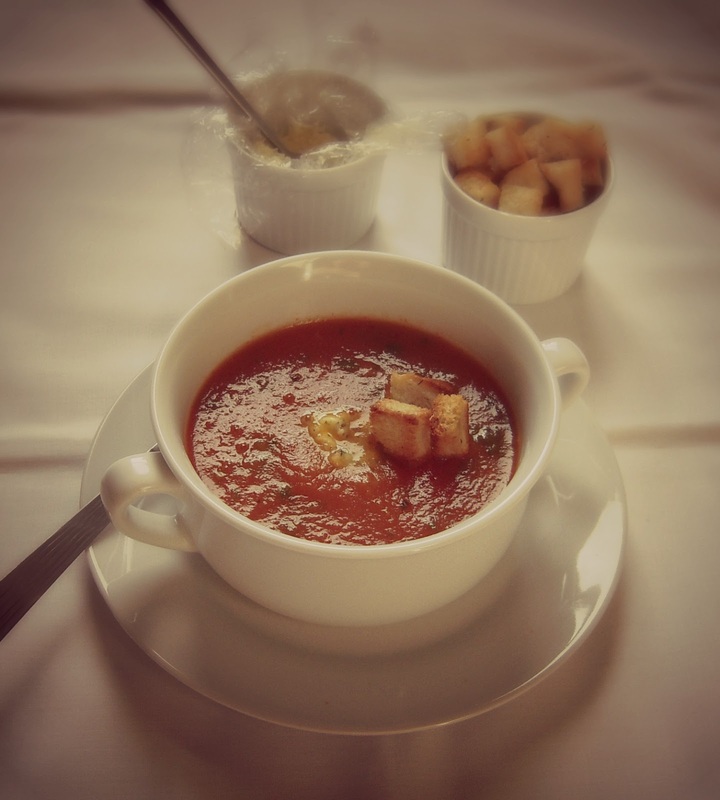 So loved your herby, warm & comforting version of the classic tomato soup!!! This version is pretty easy too..Bookmarked!! 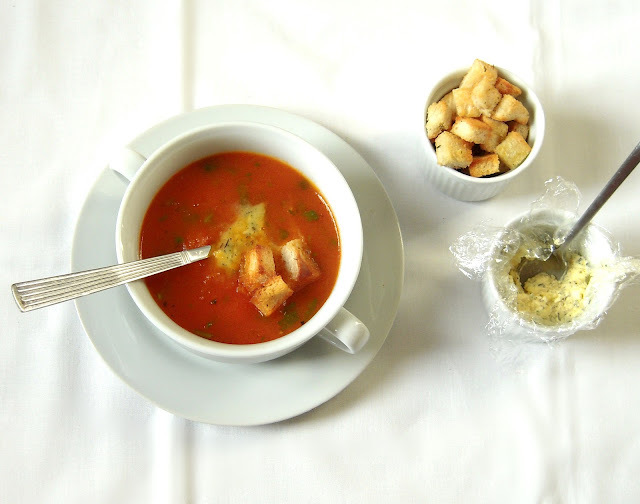 Such a super comforting soup, for Paris chilled weather i definitely need this kind of warm soup.